CHICAGO – For the past 18 months, University of Illinois Chicago faculty have been negotiating for a livable salary for full-time lecturers – a minimum of $45,000 a year – a 3.5 percent raise for all faculty. 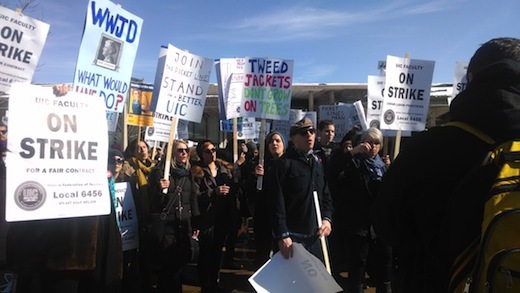 Currently there are 70 full-time lecturers who make $30,000 per year, representatives of the faculty union said. The union says the administration is pulling in more and more money, yet many instructors are making less than McDonald’s managers. The administration has offered $36,000 by 2016, while faculty at the flagship school at Champaign-Urbana was given 4.15 to 4.65 percent raises. There hasn’t been a raise at UIC since 2011, when the union was formed. After all this time with no reasonable concessions from administration, the faculty decided, as a last resort, to strike. Over 95 percent of the UIC United Faculty Union voted to approve the Feb. 18-19 strike. But the strike isn’t just about better salaries for the faculty. It is about a better education for UIC students who have seen their tuition go up while class sizes keep growing. 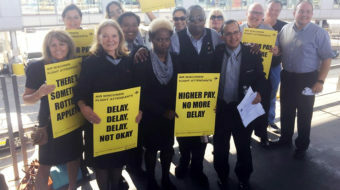 The faculty union members said they never wanted it to come to this, but after a year and a half of getting nowhere with negotiations, they saw no other option. 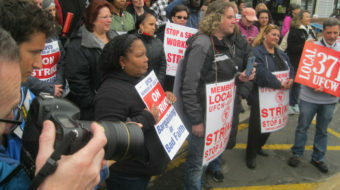 Picketing was set for 9 a.m. -4 p.m., yesterday and today, with rallies at 10:00 and 12:30. More information can be found at uicunitedfaculty.org. There is a solidarity petition at http://usas.org/2014/02/17/students-pledge-support-for-uic-faculty-on-eve-of-strike/.